Water filtration beds at the original filtration plant at Columbia Heights. December 28, 1918: Municipal Journalarticle—Water Filtration at Minneapolis. “The Minneapolis water filtration plantconsists of a 7.5-million-gallon sedimentation basin, four coagulation basins, sixteen filter beds. and a 45-million-gallon covered clear-water reservoir. The water is treated with sulphate of alumina, thoroughly mixed and coagulated and allowed to settle, after which it is filtered by rapid sand filters. After filtration it is treated with chlorine gas. It is planned to provide a plant for softening the water which will involve the construction of appliances for softening, filtration and semi-direct pumping of the water…. December 28, 1918: Municipal Journalarticle—To Investigate Cost of Influenza. “Harrisburg, Pa.-An investigation is to be conducted by the state department of health into the cost of the epidemic of influenza, which has taken 47,000 lives. Dr. B. Franklin Royer, acting state health commissioner, has announced that every phase of the social and economic cost of the disease will be surveyed. Doctor Royer has sent letters to men and women in charge of the work of fighting the epidemic in various parts of the state and asked that the information desired be returned at once to the department. ‘Professor J. P. Lichtenberger, of the Wharton School of Finance, of the University of Pennsylvania’ he said, ‘has been engaged by the department to undertake this work, and a large corps of clerks, stenographers and other officers of the state department of health have been designated to cooperate in gathering the data….’” Commentary: In the midst of a national construction push for more filtration plants, the U.S. was devastated by the influenza pandemic. It has been estimated that 500,000 to 675,000 people died in the U.S. alone and 20 to 50 million people worldwide. Reference: “Water Filtration at Minneapolis.” Municipal Journal. 45:26(December 18, 1918): 502-4. 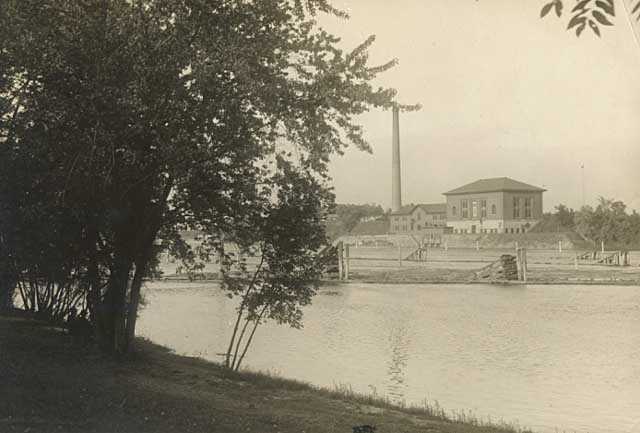 This entry was posted in Year 7 TDIWH and tagged 1918, drinking water, filtration, influenza, Minneapolis, pandemic, public health, typhoid, water, water history on December 28, 2018 by safedrinkingwaterdotcom. December 28, 1918: Municipal Journal article—Water Filtration at Minneapolis. 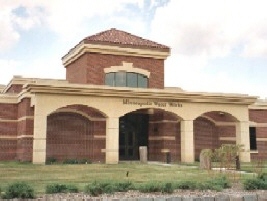 “The Minneapolis water filtration plant consists of a 7.5-million-gallon sedimentation basin, four coagulation basins, sixteen filter beds. and a 45-million-gallon covered clear-water reservoir. The water is treated with sulphate of alumina, thoroughly mixed and coagulated and allowed to settle, after which it is filtered by rapid sand filters. After filtration it is treated with chlorine gas. It is planned to provide a plant for softening the water which will involve the construction of appliances for softening, filtration and semi-direct pumping of the water…. December 28, 1918: Municipal Journal article—To Investigate Cost of Influenza. “Harrisburg, Pa.-An investigation is to be conducted by the state department of health into the cost of the epidemic of influenza, which has taken 47,000 lives. Dr. B. Franklin Royer, acting state health commissioner, has announced that every phase of the social and economic cost of the disease will be surveyed. Doctor Royer has sent letters to men and women in charge of the work of fighting the epidemic in various parts of the state and asked that the information desired be returned at once to the department. ‘Professor J. P. Lichtenberger, of the Wharton School of Finance, of the University of Pennsylvania’ he said, ‘has been engaged by the department to undertake this work, and a large corps of clerks, stenographers and other officers of the state department of health have been designated to cooperate in gathering the data….’” Commentary: In the midst of a national construction push for more filtration plants, the U.S. was devastated by the influenza pandemic. It has been estimated that 500,000 to 675,000 people died in the U.S. alone and 20 to 50 million people worldwide. This entry was posted in Year 6 TDIWH and tagged 1918, drinking water, filtration, influenza, Minneapolis, pandemic, public health, typhoid, water, water history on December 28, 2017 by safedrinkingwaterdotcom. This entry was posted in Year 5 TDIWH and tagged 1918, drinking water, filtration, influenza, Minneapolis, pandemic, public health, typhoid, water, water history on December 28, 2016 by safedrinkingwaterdotcom. 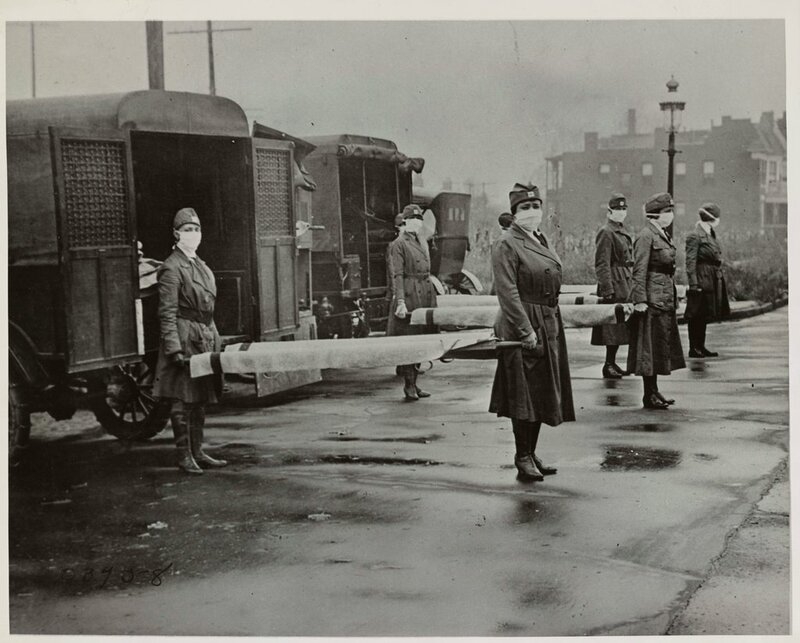 Policemen in Seattle wearing masks made by the Red Cross, during the influenza epidemic. December 1918. This entry was posted in Year 4 TDIWH and tagged 1918, drinking water, filtration, influenza, Minneapolis, pandemic, public health, typhoid, water, water history on December 28, 2015 by safedrinkingwaterdotcom.